Get your Tulip Taylor POS packs – Bounce Sales & Marketing Ltd. 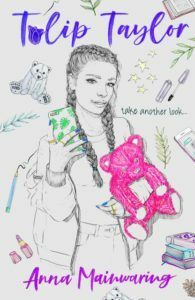 Challenged to go on a ‘survival’ reality TV show, fifteen-year-old make-up vlogger Tulip only accepts to escape her mother’s money-making schemes and protect her younger brother and sister. Set up to fail, can she prove to the TV show, the cute but annoying boy who got her on there and – most importantly – to herself, that she’s more than just a pretty face? Tulip Taylor is a warm-hearted feminist teen comedy for our social media controlled times. Order a POS pack of posters, bookmarks and pin badges featuring artwork by fashionable cover artist Niki Pilkington.